The sister and I went to a Japanese curry restaurant chain before heading down to San Luis Obispo for the weekend. Yep… that’s TWO trips for me this week! I literally returned from Portland two days ago, and only had one day to unpack and repack! I ordered the keema curry rice, which was ground beef curry with a medley of onions, shimeji mushrooms, carrots, potatoes, garlic, and red chili peppers with your choice of a soft or hard boiled egg. The curry rice also came with an option of getting corn potage, miso soup, or salad. I got the soft boiled egg, and my sister poked at it while I took a series of photos.. Google+ made an awesome GIF from the photos! I had the same dish when I went 3 years ago, where I took a much better close-up photo. But the egg wasn’t pretty. To say that curry (curry rice) is a national Japanese food is not an over statement. The British Empire once colonized India, and developed Indian curry stew into their own flavor. England’s C&B curry powder landed in Japan in early Meiji Era but some elitists already knew of ‘curry’ existence as early as the Edo Shogunate Era. Japanese curryosity (just kidding) transformed curry to appeal to the Japanese taste.. Since House Foods Inc. developed home friendly curry roux in 1926, made ‘Rice Curry’ a household name. Many other solid curry roux are available now days yet I still favor the revolutionized, not spicy – until then we had mind set of curry equal spicy – House Vermont Curry (1963) and remember the old commercial song – apple and honey, House Vermont Curry! Appearing in a curry commercial is a barometer of a star’s popularity. In 1997 baseball phenomenon Ichiro did his gig here. Keema is Indian word for minced meat and keema curry is happening in Japan! Keema, Kheema, or Qeema (Sindhi: قيمو, Hindi: क़ीमा, Urdu: قیمہ‎, Nepali: किमा,pronounced [ˈqiːmaː]; Punjabi: ਕ਼ੀਮਾ) is a traditional South Asian meat dish. The word is borrowed probably form Greek χυμὸς and originally meant minced meat. It is typically minced mutton curry with peas or potatoes. Keema can be made from almost any meat, can be cooked by stewing or frying, and can be formed into kababs. Keema is also sometimes used as a filling for samosas or naan. The word for a similar dish in Armenian is “Gheymah” ղեյմա and in Turkish “kıyma”. 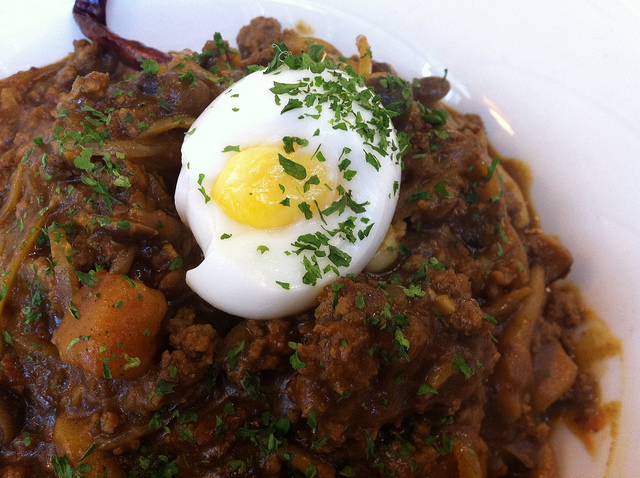 It’s safe to say that this Japanese curry rice was influenced by India. I LOOOOVE Japanese curry. I’ve never found a restaurant I like here in Norcal. I love Curry House in LA though. Perhaps I need to try this place when I’m in the South Bay!